Have you ever seen a recipe and thought I must try that? Of course you have, and for me, that was the case with this cake. It was some time last year that I first discovered the Browned Butter Peach Cake on Spontaneous Hausfrau, and I was mesmerized. Now, you’d think it was those fresh, summery peaches that drew me in, but alas, it was the browned butter. I wasted no time making the cake and enjoyed every bite. Then my thoughts turned to figs. What if I subbed figs for the peaches? Tossed them with a little honey? Sounds divine, no? A couple of weeks ago, figs started appearing in my local market, and my thoughts immediately returned to this cake. As a bonus, Sam, a family friend, had recently given me a jar of the local raw honey his family produces. Now, I’m no honey connoisseur, but this is some pretty darn good honey. Honestly, I always thought all honeys were created equal. But like the fresh produce you get at the farmers’ market, this small batch honey is head and shoulders above the mass-produced stuff. What better way to honor this first crop of figs? 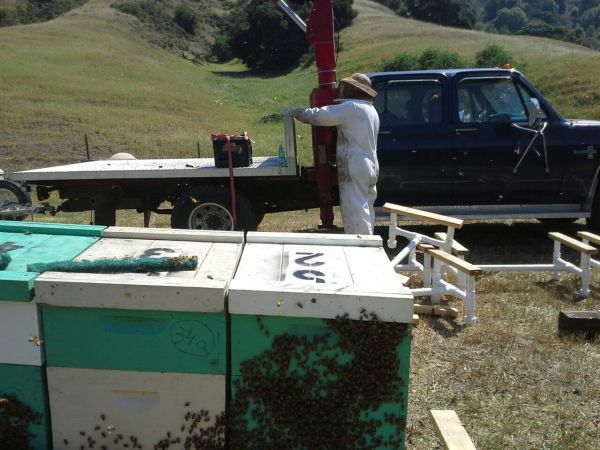 That’s Sam moving the bees at his family farm–Orbit Apiaries–one job I will not be attempting any time soon (although my brave niece Jennifer did). Now, about that cake… as you can see from the pictures, it came out a little over done, which was all my doing–I forgot to turn down the oven after roasting the figs, so it was way too hot. Crispy edges aside, the cake was still moist and sweet with honey glazed figs–perfect with a cup of tea. First, wash and halve the figs, then toss the them with the honey and a dash of nutmeg. 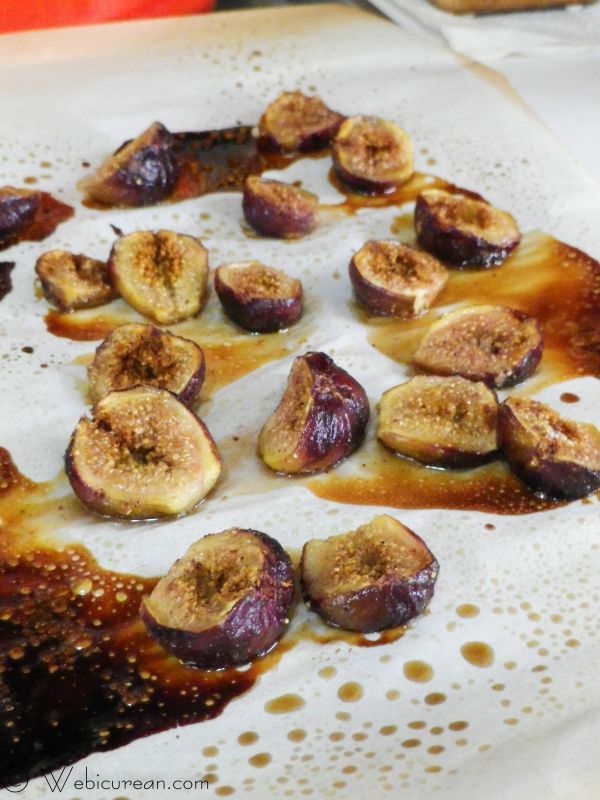 Spread half the figs on a baking sheet that’s been sprayed with non-stick cooking spray, and roast for about 20 minutes. While the figs are roasting, melt the butter in a small pan over medium-high heat. 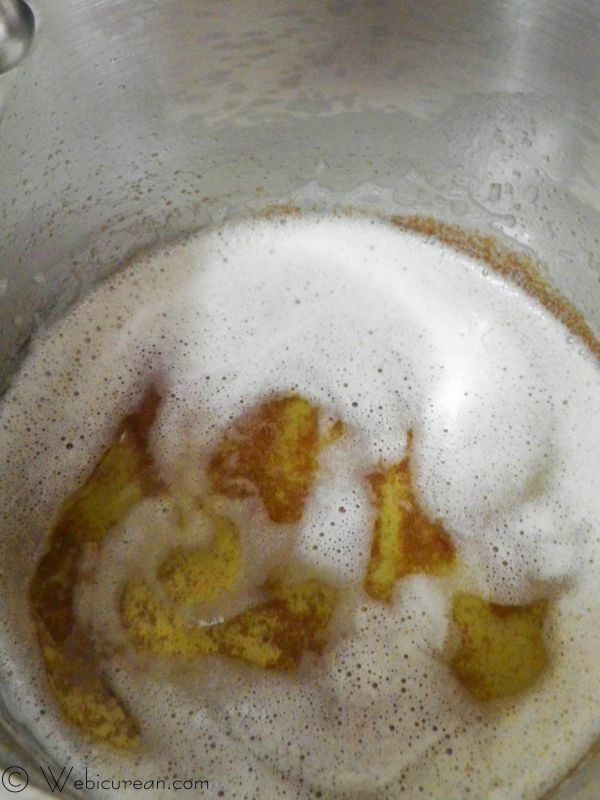 Stir continuously as the butter starts to foam. When brown specks appear on the bottom, remove from heat and cool. Once the butter has cooled enough, whip up the batter. 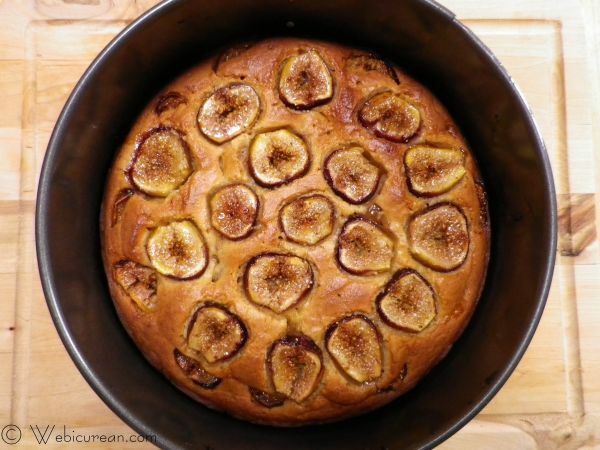 Spread half the batter in a greased, 9-inch springform pan, then top with the roasted figs. Spread the remaining batter on top of that and arrange the rest of the figs on top. Not particularly pretty, but boy was it good! 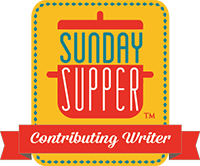 Serve on a pretty cake dish with plenty of tea on hand. 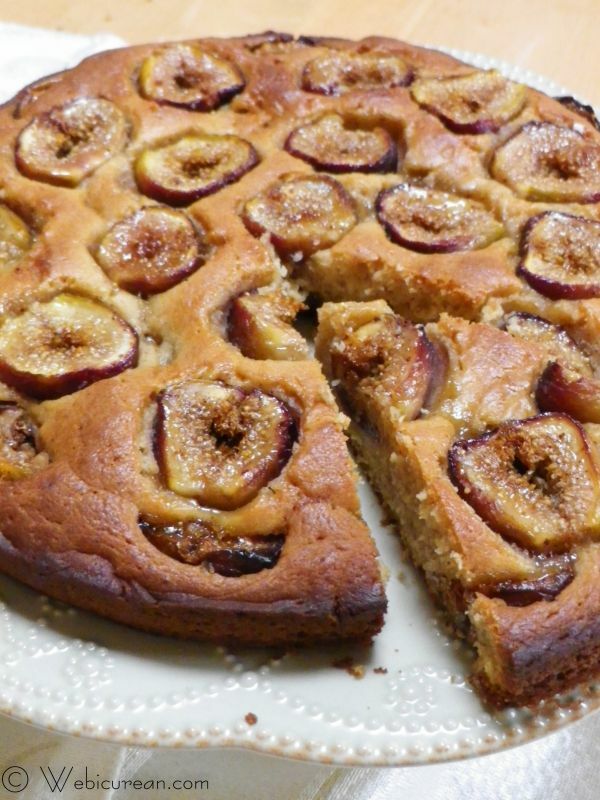 Loaded with honey glazed figs, this browned butter cake is simply divine. Preheat oven to 425F. Line a baking sheet with parchment paper and spray with non-stick cooking spray. Wash and cut the figs in half. In a medium sized bowl, toss the figs with the honey and nutmeg. Arrange half the figs on the baking sheet and roast the figs for about 20 minutes. Once the figs are finished roasting, set aside to cool. Lower oven to 350F. Grease a 9-inch springform pan with non-stick cooking spray and set aside. In a medium bowl, whisk together the flour, baking powder, and salt. 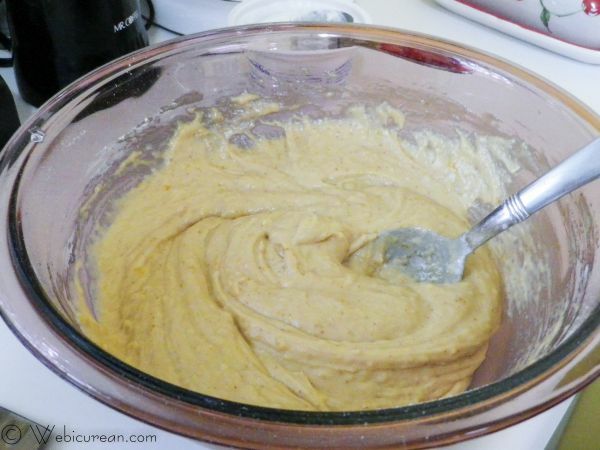 In another medium bowl, mix the sugar, brown sugar, vanilla extract, almond extract, and eggs until thick. Stir in the cooled butter until combined, along with the yogurt. Fold the wet mixture into to the dry mixture and mix until thoroughly blended. 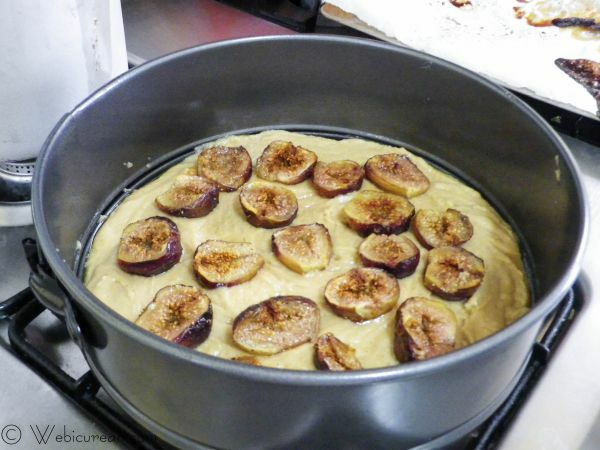 Spread half of the batter on the bottom of the pan, and arrange the roasted figs on top. Spread the remaining batter over top of the roasted figs, and arrange the fresh figs over the top. Bake about 50 minutes or until the cake is golden and a toothpick comes out clean. Cool about 30 minutes before removing from the pan. I see things all the time that I want to make right away. I can see why you wanted to make this – yum! 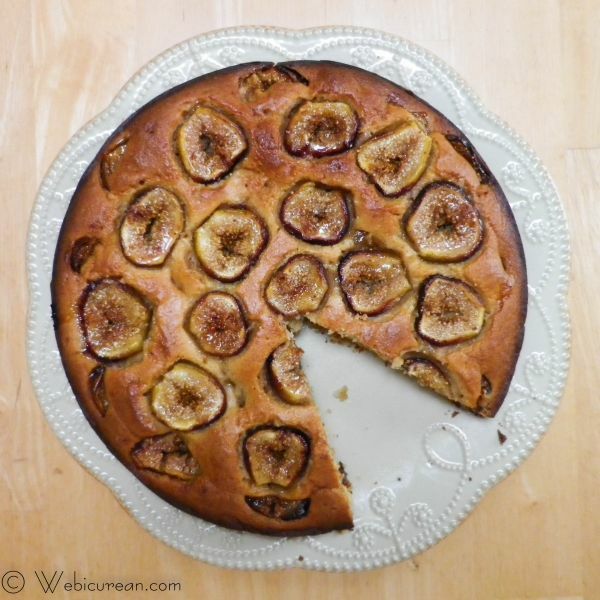 I need to try baking with figs! 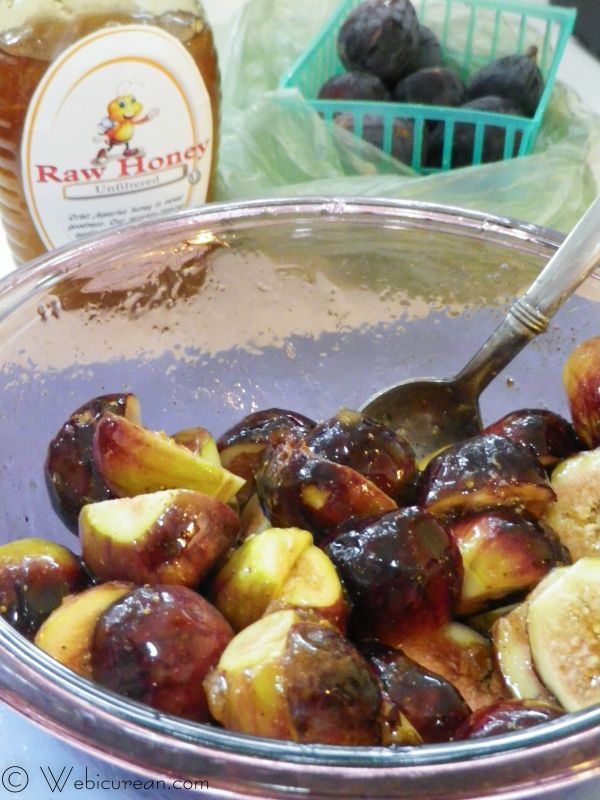 The figs get really soft and buttery … it was like eating fresh, warm fig newton! Browned butter = BEST. THING. EVER. I’d be too scared to raise my own bees!